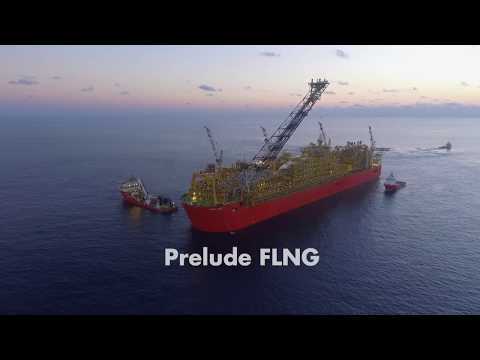 Prelude is Shell’s first floating liquefied natural gas (FLNG) facility,an offshore development that will produce natural gas from a remote field in Western Australia. Global energy demand is expected to grow by 30% between 2015 and 2040, according to the International Energy Agency (IEA) New Policies Scenario. Prelude FLNG will help to meet this growing demand, by providing more natural gas. Floating liquefied natural gas (FLNG) technology is complementary to conventional onshore liquefied natural gas (LNG) as it helps to accelerate the development of gas resources to meet the world’s growing demand. How does FLNG technology work? FLNG technology makes the production, liquefaction and storage of natural gas possible at sea. LNG is transferred directly from the floating facility to specific carriers, for convenient shipping to countries around the world. Natural gas is produced from underwater fields then processed and chilled to -162° Celsius (-260° Fahrenheit). This shrinks its volume by 600 times to create LNG. The advanced design of an FLNG facility packs a typical land-based LNG plant into a fraction of its normal size. Shell is taking great strides towards delivering the Prelude FLNG facility. Prelude is now on location, 475km (295 miles) north north-east of Broome, Western Australia. Once operational, Prelude FLNG will produce 3.6 million tonnes per annum (mtpa) of LNG, 1.3 mtpa of condensate and 0.4 mtpa of LPG. Shell has made safety the central focus of FLNG technology since we began developing it in the 1990s. We have incorporated proven LNG technologies and developed new ones to ensure the Prelude facility can operate safely at sea. Prelude is designed to remain in place in severe weather conditions and even withstand a 1-in-10,000-year storm. The Prelude facility is designed to remain at sea for around 25 years. It will be moored in the Browse Basin off the north-west coast of Australia, in about 250 metres of water. FLNG facilities can be re-deployed to develop new gas fields. FLNG technology offers countries a more environmentally-sensitive way to develop natural gas resources. Prelude will have a much smaller environmental footprint than land-based LNG plants, which require major infrastructure works. It also eliminates the need for long pipelines to land. Over the lifespan of Prelude, the project is expected to add billions of dollars of revenue to Australia’s economy, create hundreds of direct and indirect jobs, spend billions of dollars on Australian goods and services and improve the country’s balance of trade through export of LNG, LPG and condensate. 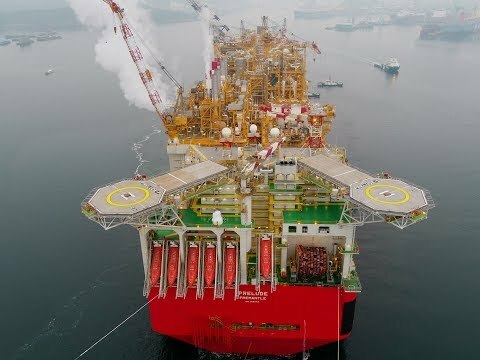 A short video showcasing the mooring of leg number eight on Shell’s Prelude, the largest floating facility ever built, to make it storm safe. Wide-angled view of a rigging crew doing a series of exercises to get their muscles warmed up. 200 kilometres off the coast of north-western Australia, a rigging crew is about to start the day. Shot panning left to right of a rigging crew standing in a circle formation. Close-up of the crew leader addressing the crew. Close-up of several of the crew members. Back to close-up of the crew leader. We are up to mooring leg number eight. Don’t become complacent. We’re halfway through it. We’ll get the next eight done safely. But this is no ordinary day at the office because they are about to moor the largest floating facility ever built. Shot taken over the ocean, panning upwards, bringing the Prelude into view at dawn. Aerial shot of the Prelude and three tugs, text appearing at the bottom. Close-up of the Prelude hull, panning upwards. Wide-angled view of Damian Wake walking on the Prelude. Close-up of Damian talking whilst he continues walking. Reverse-angled shot of Damian walking. Wide-angled view of Damian walking and talking, looking straight into the camera. Like, it is absolutely fantastic. I mean, I’ve had, what, four or five years I’ve been thinking about the mooring system. To now actually be here pulling these things in, fantastic. I am absolutely stoked, honestly. At 660,000 tonnes when fully loaded, Prelude weighs six times more than the largest aircraft carriers in the world, and it will operate in an area known for extreme weather conditions. Aerial shot of the Prelude during daytime. Zoom in slowly. Shot of fast-moving, dark clouds. The need for this mooring system to work is critical. We could hit the cyclones and this mooring system will hold us in place. Close-up of Damian speaking to off-screen interviewer against an out-of-focus background on the Prelude. To do that, the project team has created one of the strongest mooring systems ever built. Deep inside Prelude is a turret that allows the facility to rotate or weathervane. Beneath Prelude, one of the largest chains in the world. Nearly 25,000 links attached to mooring piles drilled deep into the ocean floor. Now the team is preparing to connect chain number eight, making Prelude officially storm safe. Shot panning left to right taken at sea of a tug sailing away from the Prelude. To the right of the Prelude is another tug. Animation of the Prelude set against a backdrop of blue sky with white clouds. Underneath the water surface, a series of chains. In the top left-hand corner, a logo and text reading TechnipFMC. Sped-up sequence showing the turret being brought over to the Prelude and placed onto it using a series of cranes. Sped-up sequence via an overhead shot of the turret being lowered into place while various engineers look on. Wide-angled view of some large machinery making chain links. Close-up of a chain link being welded into shape. Wide-angled view of a production facility with a large pile of chain links in the foreground. Side-angled shot of a mooring pile suspended to a crane-like structure, ready to be lowered into the ocean. Overhead shot panning down slowly of a mooring pile. Animation of the Deep Orient lowering a section of chain into the ocean. In the bottom right-hand corner, text reading Technip. Animation below the sea surface showing the chain being lowered. Animation of a chain being hauled as the yellow socket locks it into place. And what’s absolutely incredible about this, they’ll be pulling in [CDTS1] one or two links that they’ve already predetermined during the pre-lay, which is quite an incredible feat of engineering and installation. Close-up of Damian talking to off-screen interviewer against an out-of-focus background on the Prelude. The operation to moor Prelude begins with the rigging team making the steep descent into the bowels of the turret. Outside, three tugs are holding Prelude in position. The crew on the Deep Orient has retrieved the mooring line. On Prelude, a giant winch is standing by to haul in the chain, and the engineers are ready to monitor each and every move. Everything is in place. Wide-angled shot panning left to right of three tugs and the Prelude at dawn. Wide-angled shot taken inside the turret showing an engineer climbing down a ladder. Close-up of an engineer climbing down a ladder into the turret. Close-up of three chains, panning left, bringing several engineers who are talking into focus. Wide-angled view of the three tugs holding the Prelude in position. Shot panning left to right of the Deep Orient. Close-up of the giant winch on the Deep Orient. Shot of two operators sitting in a cabin on the Deep Orient monitoring the winch. Close-up panning upwards of two engineers in a room with lots of papers and radios in front of them. Aerial shot of the Prelude showing its two helidecks. All positioned, ready to go, so it’s now up to the team on-board to finish the job. Close-up of Damian speaking to off-screen interviewer. Close-up of the crew leader and a member of the rigging crew. Reverse-angled shot of two crew members inside the turret. Close-up of the crew leader talking into his radio. Shot of two operators sitting in a cabin on the Deep Orient monitoring the winch, one the men speaks into a radio. Yellow winch pay in, easy. Yes, pay in five metres. Close-up of the winch starting to turn. Shot of a chain beginning to be lowered into the ocean, two members of the rigging crew to the side. Aerial shot of the Deep Orient. This is the main event. We are pulling in the chains one by one and connecting them off. This is the culmination of years of planning to bring this to a head. Awesome, absolutely awesome. Close-up shot of the chain being lowered taken from an underwater camera. Text on the bottom displaying coordinates, depth and altitude data. Close-up of Damian talking to off-screen interviewer inside the turret. In the background, two rigging crew members. Aerial shot of the Deep Orient and the Prelude. Close-up of the crew leader speaking into his radio. Remazel winch, copy. Yes, what loads have we got on the winch at the moment? Slowly but surely the winch hauls in the chain. Close-up of the chain being hauled in. Close-up, side-angled view of an engineer speaking into a radio while closely watching a laptop showing the chain being hauled in. Side-angled view of the two operators on the Deep Orient operating the winch. Winch good to go another four metres. Pay in four metres. And it begins to emerge. Sped-up sequence taken from overhead inside the turret. Close-up of deep blue water. Close-up of the crew leader speaking straight into the camera. You can probably see the yellow socket just over the side here. Wide-angled shot taken inside the turret, just under the surface of the water a yellow socket starts to come into view. Close-up of two members of the rigging crew. Close-up taken from an underwater camera of the chain being hauled upwards through the chain connector. Reverse-angled shot of an engineer, out-of-focus, looking at a laptop showing the chain and chain connector. Back to the underwater close-up of the chain connector. Close-up of Damian talking to off-screen interviewer in the turret whilst gesticulating with his hands. That bang you just heard are as the chain comes through the chain connector, the engineers are looking for a particular link and that’s when they know they are, they’ve pulled the chain into the right length and that is what then holds us in place to the seabed. Reverse-angled view of a rigging crew member in the turret looking upwards. Close-up, reverse-angled view of a rigging crew member looking down at the pool in the turret. Close-up of the chain being hauled up slowly out of the water. Close-up of the winch turning. Close-up taken from an underwater camera of the socket locking the chain into place. Close-up of the crew leader speaking into his radio. A final turn of the winch… and the last link locks into place. Confirm please that the golden links are sitting nicely. Yes, understood. We’re clear to release the load. All stop on the main winch. That’s all stop, mate. All stop. Close-up of an engineer talking into his radio. Back to close-up of the crew leader talking into his radio. Close-up taken from an underwater camera of the socket. Back to close-up of the crew leader talking into his radio. Close-up shot panning left to right of two engineers looking at a laptop, one engineer speaking into a radio. Side-angled view of the Deep Orient operators operating the winch, one of them talking into a radio. And with the eighth mooring line connected, Prelude is storm safe. Aerial view of the Prelude, the Deep Orient and the three tugs. Shot of several members of the rigging crew in the turret shaking hands, congratulating each other. Close-up of the two engineers fist-bumping. Side-angled view of the two Deep Orient operators high-fiving, then one pats the other on the back. Close-up of a chain link, going out-of-focus. Coming into focus as seen through the opening of the chain link, several rigging crew members still inside the turret. Reverse-angled view of the crew leader inside the turret looking over to the other side of the pool where members of the rigging crew are still at work. Close-up of Damian speaking straight into the camera. So this is one of the 16 mooring lines that will secure the Prelude facility to the seabed for the next 25 years. This is number eight, so we’re not going anywhere. This is fantastic. Great job. Thank you very much. Close-up of several chains and their sockets underwater. Shot of Damian shaking hands with the rigging crew leader. They both turn towards the camera and give two thumbs up. Aerial shot of the Prelude, Deep Orient and the three tugs at dusk, zooming out slowly, text appearing at the bottom. 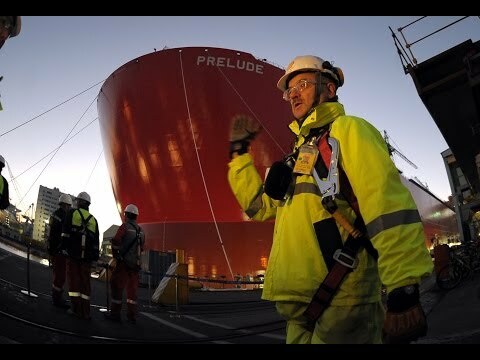 A video that shows the Prelude FLNG facility being towed to Australia. Wide shot of Prelude FLNG at SHI shipyard. Footage of Prelude FLNG being towed away from the quay. Aerial shot of Prelude FLNG being spun around. Prelude FLNG passing through frame. Shots of Prelude at sea. Wide shot of Prelude at sea. Shots of Prelude crew waving to camera. Caption: And more and cleaner energy for the world. Scene showing the smooth surface of the sea, zooming out to show a red gas platform with tall crane the top of which is off camera. Camera zooms in to show machinery onboard ship and crew members wearing hard hats walking towards ship. Scene changes to show steam blowing at a distance. 2016, obviously it’s about steam blowing. Scene shows workers atop a tall platform.The shadows of steam blowing show on landscape. Our pipes are behaving well. Nice, white clouds. We’re happy, job done. Shot of steam blowing above. When you see basically what you have designed through the years turning into life, it gives you a great feeling. James standing in front of machinery wearing hard hat and safety glasses. Scene changes to show steam being blown at distance. Shots show tankers at sea. Scene showing same tankers taken from above. There she goes, pile number five, going up in the air. Sixteen of these is what’s going to hold Prelude safely in place for the next 25 years in cyclone 5 conditions. Nine stands in front of lifting machinery lifting pipes into the air. Scene changes to show pipes and tanker from above. Now, we need to be a bit quiet because actually here we are running live plant. We are currently in the middle of steam blowing and that means that we are running boilers, but what we do here is we generate steam, and with the steam we generate power, electricity and the power that we need to be able to cool down the gas on the LNG side. So, this is the heart, if we don’t have steam, we will not have LNG and we will not have anything else. Sven standing in front of other workers at desk in the background. Scene changes to show workers in front of monitors. Scene shows large room with workers at desks and pans back to Sven standing at one side. Workers with lots of papers and charts on desk. Turning machinery. Workers in hard hats working on pipes. The weld is now on, everybody’s happy. This will just continue 24 hours a day, seven days a week. This pipe is going just off the coast of Australia. It’s got quite a way to go. Large machinery turning. Workers in hard hats walk in from of large machinery and pipes. Close up view of tanker from the front. PRELUDE in white is on side of red tanker. These guys, material handling team three, so these guys have the job of carrying the insulation from here, up the staircases to the work faces. It’s an essential part of the process, so we’re going to give them a little acknowledgement of what they’re doing. Workers wearing orange overalls and yellow hard hats stand in a row. Insulation is being loaded on their backs securely. Workers shows thumbs up. Okay, J H Kim [?]. Workers cheer and wave their arms. We’ve got about 100,000 sq metres, the equivalent of 20 soccer pitches or rugby pitches. Workers with heavy loads on their back walk away from camera. Shot of Prelude vessel out at sea. Smaller vessels around it. Manifold and tie-in systems lead. What’s happening right now is we’re about to install one of the Flowline Jumper Spools, a very important part of the whole system; it transports gases from the production manifolds over to the Plet so can get it to the FLNG. Side view of gas platform. Shington Widjaja with white hard hat with Shell logo. All the years of hard work all need to come together now, so it’s really time to be able to do it right. Night shot of gas platform lit up. Lights reflecting on the sea surface. Machinery being lowered. PRELUDE in white on red background. Aerial shot of Prelude from above. You know when you come here day to day it’s a bit difficult to see, but you know when I take visitors around here, every one of them are totally impressed with what the project team has achieved and I think everybody has delivered very, very well in 2016 and can be very proud of what we have achieved. Didrik Reymert with white hard hat with Shell logo on talks to camera. Camera zooms out to show Prelude in its entirety. PRELUDE IN 2016 in red on white background. 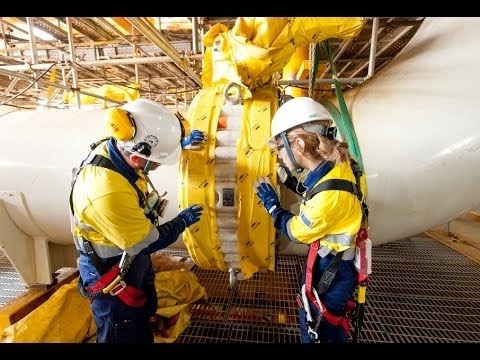 Engineers journey to one of the world’s most remote places to install equipment on the seabed for Prelude, Shell’s floating liquefied natural gas giant. Last year we watched as Prelude took shape in the bustling shipyards of South Korea. Voice over: Now far off the coast of Western Australia, another vital aspect of this world first project is beginning to emerge. Voice over: Deep beneath the sea, Prelude is connected to a critical network made up of Christmas trees, manifolds and flow lines, all connected to giant anchor piles. The role of this network is to control the flow of gas. Voice over: Like here in Henderson, Western Australia, where the giant anchor piles were manufactured then loaded out for deployment. Voice over: And in Karratha we’re the four Christmas trees were loaded on board the North Sea Atlantic. Voice over: In total 6 mobilisations across three different countries involving 10 vessels were required, before everything was finally in place. Voice over: On the 8th February, the construction vessel the North Sea Atlantic set sail. Her destination, the prelude gas field, a three day journey. Voice over: The moment of truth had arrived for the subsea team. Installation began with an anchor pile. Voice over: In the water, the operation enters a completely different world. The ROV crews become the eyes and arms. Voice over: By the time we get to the seabed we will lower this, because of the weight of the pile, it will sink below the seabed, until it is about 8 metres below the sea bed. Voice over: While state of the art technology allows team of surveyors track each movement as the anchor pile descends through 250 metres of water. The result is that even in near zero visibility, the giant structure, can be guided into position, with pinpoint accuracy. Voice over: Prelude’s manifolds, xmas trees and anchor piles are now in place. The campaign was completed in 21 days, 8 days ahead of schedule without incident. Paul Hoban: ” Quite frankly, this is the best campaign I’ve ever been involved in. It was down to personal responsibility. 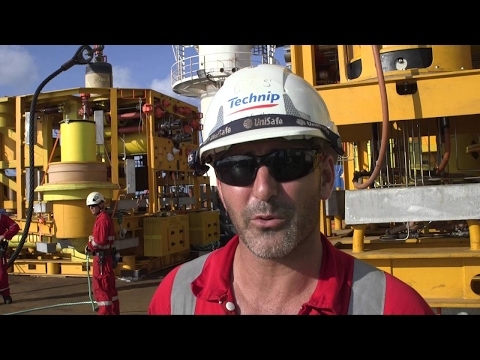 People both in Shell and our contractor Technip really took ownership of their scope. They innovated when they had to and they delivered a safe, efficient and high quality job. That’s everything you can ask for. Voice over: And step by step, Shell’s Prelude FLNG project has moved one step closer to becoming a reality. Sound of shell music fades out. Construction shots Prelude FLNG Project, SHI Shipyard Geoje. In a world first project of extraordinary scale, Shell is building a giant floating facility that will liquefy natural gas at sea. And from the shipyards in Korea, to the remote waters of Australia, right across the world, 2015 has been a year of remarkable achievement. 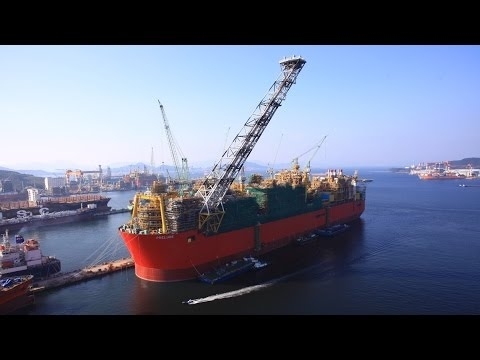 Aerial footage of last topside module installation, SHI Shipyard Geoje. In Geoje, Prelude continued to take shape at an astonishing pace. We watched the last of the topside modules installed onto the hull. Interior Prelude storage tanks, SHI Shipyard Geoje. We saw the enormous storage tanks take shape inside the hull. Jean Chaplain, storage tank lead. Engineers climbing Prelude flare tower, SHI Shipyard Geoje. And we climbed up to the top of Prelude’s 180m long flare tower. Willem Keij, offshore installation lead. Prelude mooring Chain, Vicinay Cadenas, Spain. And holding everything to the seabed, was the great chain of Spain. Dean Fresher, Heavy Lift Specialist. Ewoud van Haaften, senior offshore structures engineer. Measuring 17 kilometres long, weighing nearly 10 and a half thousand tonnes, it’s the largest chain of its kind ever built. Noble Clyde Boudreaux Drilling Rig, North Western Australia. In the remote north of Australia, the sun was setting on a very different project, in a very different world. After two years, the wells campaign on the Noble Clyde Boudreaux, was coming to an end. Kira Evans, Graduate Wells Engineer. Gary Wright, Offshore Drilling Supervisor. Deep Energy, North Western Australia. And working right beside her was the Deep Energy as installation of Prelude’s subsea equipment began. 12 kilometres of flowlines and 8 plets were installed in one of the world’s most remote locations. And they will soon be joined by the production manifolds and risers. Shington Widjaja, manifold and tie-in systems lead. After four years in construction, the subsea team was getting ready for their final test. ASL Shipyard, Singapore, Prelude Infield Support Vessels. And right across the border, Darren Yates was having triplets; again. Off camera: “And have they been good kids or bad kids? Prelude’s support vessel the RT Kuri Bay, was ready to launch into the world. Darren Yates, Project Manager Services and Logistics . ASL Shipyard, Singapore, Prelude Infield Support Vessels launching. Fantastic, absolutely spectacular to see. Executed to perfection and she’s looking beautiful in the water. Prelude Flare Lift Installation, SHI Shipyard Geoje. Vision: Sweeping shots of Prelude. In a global engineering project of extraordinary scale, destined for gas fields, previously thought too challenging. Shell is building a floating facility that will liquefy natural gas, at sea. Piece by piece, 14 gas plant modules have been built on a quayside, then carefully lifted on to a giant hull. Now the last module is ready for installation and Prelude is taking shape. 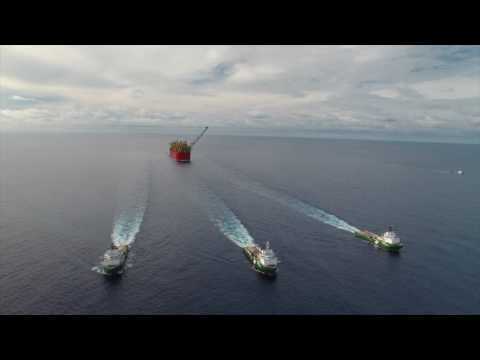 Vision: Aerial shots Prelude FLNG. 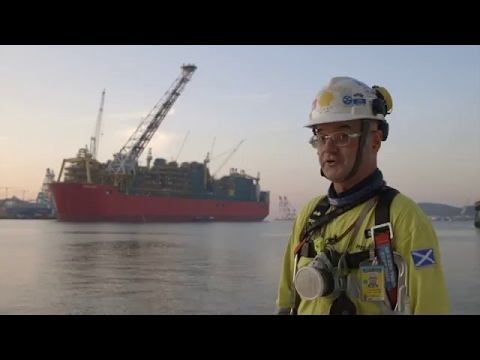 Super: Huw Jones, FLNG Construction Manager. Vision: Prelude LNG storage Tank. Super: Jean Chaplain, Storage Tank Lead. Vision: Interior of liquefaction module. Super: James Nafraicheur, Pipe Engineering Lead. Vision: Marine Loading Arms in Drydock. I tell you what. I’m going to give you another analogy. I’m going to talk about Wales winning the Rugby World Cup. We’re just getting ready for the semi-final. From paint that will last 25 years at sea to five-star cabins in one of the most remote locations on the planet, Shell’s Prelude FLNG team are building one of the largest floating structures ever and taking the energy industry to a whole new level of innovation. Sped-up footage of sections of plant installation being lowered into place by crane. A man on scaffolding is spraypainting pipes on the new plant installation bright yellow. A man in a hardhat and overalls draws a curtain across an interior cupboard. Two technicians inspect a girder in the plant. One of the technicians is using a handheld device to take a metered reading. Sparks fly from a welding operation. A man crosses the floor of the vast interior of the gas plant. A huge machine, constructed of massive girders, moves along inside the plant. Sparks fly as a man welds a huge curved pipe. Construction equipment is moved along above ground level at a dockside, using an enormous movable gantry. Sped-up footage of a harbour scene, machinery and vessels coming and going. Sped-up night-time footage of a drydock filling with water. As the day breaks, the water level rises to capacity. Digital sound effect. Camera zooms in from out-of-space to the northern coast of Australia. Aerial footage of a vast gas plant. Two workers in protective gear. Dramatically sped-up footage of two days’ worth of activity on the gas plant construction. Inside the gas plant, a system with a massive central pipe is moved in through a large door. Two workers stand inside a large circular chamber or room. A truck is parked in the middle of the room. The camera pans up from the workers to an opening several storeys above in the circular chamber. A worker in protective gear motions directions to someone off-camera. Sped-up footage: the vessel in dry dock is being pushed or accompanied out of the dock by two relatively small tugboats. Sped-up footage from the water’s surface as Prelude is floated out to sea. View from a further-away elevated position of Prelude being guided out of drydock and into the harbour by seven or eight tugboats positioned at various points around the vast vessel. The words Built to Last swoosh into position under the name Prelude on the vessels hull. Busy harbour scene at Geoje Island, South Korea, as seen from an elevated position, looking down over treetops. Prelude docked. The huge gantry stands over the prow. Outdoor view of construction underway on the gas plant. Camera pans down from upper left to lower right, showing construction equipment in various stages of assembly on the quayside. Two men in protective gear discuss something on a piece of paper one of them is holding. Outdoors: Huw Jones standing several storeys up on scaffolding or partially constructed part of the gas plant. Outdoors: two men in protective gear climb a ladder to a platform. The men make their way across the platform. View from below as the men make their way up yet another ladder. View from a little distance away of the gas plant under construction. The two men approach the camera as they ascend a ladder. Camera position switches to behind the two men as they reach the platform. The two men examine massive pipes and tubing on the platform. The sound of a drill can be heard. Two men standing on scaffolding work on a large vat-like structure. Huw Jones standing outdoors, addressing the cameraperson/interviewer, the construction site behind him. The camera looks straight up the side of the construction showing girders and pipes and tubes crisscrossing one another. Two workers walk along the topmost platform of the construction site. One of the men raises his hand to shield his eyes from the glare as he stares out ahead of him. View from behind the two men as they survey the scene below and in front of them. Prelude lies in dock a short distance away. View past a man’s shoulder and arm, the construction site in the distance. View of the construction site. Huw Jones standing outdoors, addressing the cameraperson/interviewer, the construction site behind him. He grins as he finishes talking. The massive gantry, positioned above the Prelude, and what appears to be a floating platform in front of the Prelude, move in a synchronized fashion as the gantry begins to swing slowly diagonally to the Prelude. A high-pitched whining noise can be heard. Side view of the Prelude, cranes in the background. A crowded elevator full of men in protective gear. View of the side of the Prelude as seen through the elevator door as it ascends the side of the vessel. Another shot of the inside of the crowded elevator. View of the dockside as seen through the elevator door as it ascends the side of the vessel. View from an elevated platform alongside the Prelude. The camera is looking down its vast length. The camera follows two men as they walk along elevated platform. One of the men walks to the railing. The camera looks down over the railing at the ground far below. View across the construction site. View across the construction site, the Prelude docked in the background. The camera draws rapidly back from a computer-generated model of the completed Prelude on a glassy ocean. Busy dockside, men on foot, bike or scooter pass by. View of the busy dockside from the front. Workers on motorbikes, scooters and bikes are coming and going. Sped-up footage of harbour activity. View of Prelude as seen in a scooter side-view mirror. Sped-up footage looking across the bustling dockside to Prelude in dock. Men on bicycles and scooters make their way along the dockside. The massive Prelude hull looms in the background. The camera looks up at Prelude’s hull. The massive gantry stands over the Prelude. A forklift drives along the floor of a massive hangar or factory. Steve Bell, wearing protective gear, watches the activities within the factory. Men on scaffolding painting a massive girder yellow. Factory floor; a man in a gas-mask approaches an unidentified piece of construction. Steve Bell climbs a ladder to the scaffold level above. Close-up of a handheld meter he uses to take a measurement from a girder. Side shot of Mr Bell, accompanied by a female colleague, taking measurements from the girder. A man in protective gear and gas-mask holding a compressor spray-can. Mr Bell addresses the camera. A man in heavy protective gear and gas-mask sprays the inside of a girder yellow. Close-up of a handwritten weather chart recording conditions for different time intervals for the day. Mr Bell addresses a small group of workers on the factory floor. Close-up of a man donning a face-mask over his hardhat. Steve and the other workers adjust their gas-masks. Steve and a colleague inspect paintwork on the structure above them. A man climbs a ladder to the scaffolding above. A man on hands on knees does a close inspection of the painted floor. A man inspects a painted pipe closely with a torch. A man inspects painted girders closely with a torch. Mr Bell and a colleague move in for a closer inspection of a painted pillar. Close-up of the pillar surface. Mr Bell walking along a long, dim area, examining the structures overhead. Mr Bell, surrounded by his colleagues, makes notes in chalk on the factory floor. Profile view of Mr Bell. The camera pans right to show the colleague who is talking to him. The painting team gathered around Mr Bell as he makes notes in chalk on the factory floor. Close-up of the chalk notes on the floor. A painter uses a roller to apply paint to a previously painted girder. Painting equipment on the factory floor. View across the harbour of the construction site. Camera pans right from one side of the harbour to the construction site. A large white building on the dock. Scaffolding and platforms are visible in the foreground. Brian Casey seated in a boardroom with two colleagues. They have lots of paperwork spread out in front of them. Mr Casey addresses the camera. An empty presentation room, with rows of seats and presentation equipment at the front. Golf simulation area, with putting area and massive screen. The camera pans around a computer-generated model of the completed Prelude floating on a glassy ocean. A helicopter lands on the Prelude’s deck. Close-up of a printout of the cabin design. Mr Casey and colleague in the boardroom. Mr Casey addresses his colleagues. Close-up of Mr Casey’s colleague as he pores over the paperwork in front of him. Mr Casey and his colleagues in the boardroom. Mr Casey addresses the camera and his colleagues. Close-up of the printout of the cabin. Mr Casey and colleagues in the boardroom seen through a large glass wall. View of the Prelude from dockside. Camera pans up from the top of the construction site to look out across the length of the site. View of a cranes and buildings on a distant platform. Frank Groen walks toward camera as he ascends a gangplank. Mr Groen and colleagues inside a lift. View from dockside immediately alongside the vast side of the Prelude. The Prelude, tugboats anchored alongside. The living quarters’ superstructure is visible at the stern. View out across the harbour from the Prelude’s deck. Mr Groen and a colleague make their way along the cluttered deck. Close-up of a plastic-covered deck layout and a sign reading: D Deck, with some description of the rooms on that deck. Mr Groen and his colleague approach the camera as they ascend a flight of steps. Close-up of another deck layout. Frank and Brian ascending another flight of steps. Close-up of feet as they ascend steps. Brian disappears through an open door on the deck. Close-up of feet moving along a very narrow passage. The camera moves along a corridor filled with panels of instrumentation. The camera follows Frank and Brian as they make their way along the corridor. The camera has turned upwards to show the conduits and pipes running the length of the corridor ceiling. View from the front of Frank and Brian walking along the corridor. Frank and Brian enter a door in the side of the corridor. Frank and Brian inside an unfurnished cabin. Brian pulls out drawers under a bed. He then opens and closes a cabinet at eye-level. Brian draws a curtain from a panel against the wall and draws it across the bed. Brian opens a narrow cupboard to reveal shelves and hanging space. Brian enters the very small bathroom cubicle. Brian motions across the top of the bathroom cubicle. Brian twangs the overhead clothesline. Frank and Brian pull out the sofa bed to reveal a hidden mattress. Brian pushes his fists into the mattress to test its firmness. Close-up of the sofa bed. Frank lowers himself onto it. Frank gets off the bed. View of Brian and Frank exiting the passage into daylight. The construction site and bustling dockside. Aerial view of vehicles coming and going on the bustling dockside. A man and woman in protective gear walking outside the construction plant. A man in protective gear walks quickly along a platform surrounding a vast vertical tunnel. A man in a hanging scaffold is being lowered into the tunnel. A man in the construction site securing loose, hanging cables or wires. Men at work in the construction site. A close-up of a brightly-coloured sign reading: Danger. Men in protective gear direct a very wide construction vehicle out of the factory. The camera follows a woman in protective gear as she rounds a pile of construction equipment in the factory. A man welding something on the floor. ‘'If you come back here in three months' time there's going to be a huge change here... and taller. Frank Groen and a colleague approach the camera as they descend a flight of steps outdoors. View across the harbour of the construction modules being assembled. A man in protective gear at work on the construction site. A man on scaffolding hoists a piece of equipment up to him. Dockside view of the side of the Prelude. The camera follows the progress of a man walking along next to the vessel. Huw addressing the camera. He grins broadly as he finishes talking. Final shot of the distant Prelude lying in the harbour. Rushing noise. A spiral of yellow, turquoise, blue and purple splits and morphs so that they form the logo for dsp. An eye encircled by a horizontal oval. Energetic music with industrial noises. A chunk of world first technology, a tanker of liquid nitrogen, and a team of nervous engineers. Machinery in motion, close up. Machinery in motion, long shot. Group of hard-hatted workers in discussion. With a prestigious project, and years of work behind them, the test they’re about to do needs to succeed. Engineers gather around waiting for a machinery test. Close up of machinery in motion with steam being emitted. Longer shot of machinery with platform being lowered. Shot of machine being tested and part of it being pulled away from body of machinery. Workers at work on shipyard factory floor. It’s revolutionary, pushing the boundaries of innovation. Destined for fields previously thought too challenging, a gas plant is being shrunk to a quarter size, and carefully squeezed onto a floating hull. location of Prelude gas field. Two workers in breathing apparatus. Rapid motion works in outdoor shipyard. Two men in protective headgear. Inside the Prelude project vessel looking up at the sky. A worker in protective headgear indicates and points at something. At half a kilometre long, Prelude is one of the largest structures that man has ever sent to sea. The Prelude project vessel leaves the slip and is led onto the sea, fast motion. Prelude, Freemantle is written on back. Long shot, long pan across Korean shipyard. Prelude is designed to cool gas to a chilling minus 162 degrees Celsius. This shrinks it, and turns it into liquefied natural gas, or LNG. The challenge is in transferring this volatile liquid from Prelude onto a carrier while both bob up and down on the surface of the ocean. The carrier and the facility are actually moored together, and during this offloading process, they will be moving, and probably moving in different directions. Ideally, we would actually offload it around every five or six days, and we’ve had to make sure that we can do this safely. Scale model of Prelude and carrier in a lab tank. Stock footage of airline refuelling in mid-air. Technology for transferring fuel between planes has been in use since World War Two, but technology that can speedily transfer vast quantities of liquid gas between vessels at sea has had to be perfected. That next level of innovation is being created in France. For the Prelude project to be viable, this marine loading arm has to work. Cris Marino is here to test it for the first time. French workers at work outdoors on machinery. Side view of Cris driving through the countryside. Shot of marine loading arm when Cris arrives at destination. There it is, that’s the first marine loading arm. That is just incredible. That is absolutely – that’s sublime. That’s amazing. Long shot of marine loading arm. Cris looking up at marine loading arm. Cris’s excitement is understandable, when you consider it’s taken 50,000 man hours to get to this stage. French workers wearing protective clothing and headgear at work outdoors on machinery. The reason why I almost love these loading arms is they were first of a kind. Group of hard-hatted workers walking in a group and viewing the motion of machinery. Men point at the loading arm. You can imagine grabbing something that no one has ever played with. And then that gives you a sense of enjoyment, fulfillment, and it’s also scary at the same time. You know, you don’t really want to take something brand new and break it. Long shot of loading arm. This enormous arm should be able to swivel, rotate, and follow the motion of an LNG carrier for the 15 hours it’ll take to offload. Hard-hatted workers viewing the motion of machinery. Various close-ups of parts of the loading arm. It’s a brand new arm, so it’s important that we see that the system works spot on, first time. Machinery in motion. Men standing in group testing the equipment and watching. A dynamic test bench mimics the movement of the carrier. The arm should automatically pull itself into place. The team watches anxiously. Machinery in motion. The group of workers in protective clothing look on as the machinery is tested. It’s just incredible, huh? The dynamics. Machinery in motion. Cris talks to a fellow worker. But then, something unexpected occurs. The loading arm has retracted too far, and collided with itself. The engineers check for damage. The good news is that none of the equipment was damaged during the test. Cris walks toward the camera. Workers in protective clothing work on the loading arm. Despite the hiccup, the test is a resounding success, and with a plan in place to make sure it can’t happen again, they move on to the ultimate test. Prelude’s liquefied natural gas will be stored in colossal tanks deep inside the hull at minus 162 degrees Celsius. Steam rises from pipes filled with liquid nitrogen. Long shot looking up at the hull. View of Prelude’s gas tanks under construction. Two workers discussing something and looking up. The team in France needs to prove the arm can perform in the extreme cold. It is effectively the first time where we’re running the Prelude LNG loading arm at cryogenic conditions. Yes, it is exciting. They fill the arm with liquid nitrogen. It’s cold, but not flammable, like liquefied natural gas. Steam rises from pipes filled with liquid nitrogen. Liquid nitrogen fed from tanker into the machinery. Once we achieve the low temperatures that we need, we will complete what we refer to as an emergency disconnection. And that’s critical for ensuring the facility remains safe in case of emergency. Various close-up shots of parts of the loading arm. The test bench will simulate extreme sea conditions. Once the movement exceeds safe limits, valves inside the arm should close, allowing it to break away from the carrier. Hard-hatted workers looking up at the machinery. In this simulated emergency, only the liquid between the two valves should escape. If the valves didn’t function, we would see continuous liquid nitrogen being spilt into the ground. So there is a very, very strong requirement here to demonstrate that we do not have that occurrence. Cris talking in front of machinery. Machinery separates and arm withdraws. Watching engineers give thumbs up. Cris laughing and walking off camera. Shots of different parts of machinery. The marine loading arm has functioned perfectly. It will now be dismantled and shipped to Korea. Once six more are built and tested, Prelude will be able to offload liquid cargo at sea. After 14 months of construction, the Shell Prelude FLNG project continues to create history. Measuring nearly half a kilometre in length and weighing over 200,000 tonnes, the facility's enormous hull is ready to take to the water for the first time. Join the team in Goeje, South Korea, as it prepares to launch the largest hull ever sent to sea. Far off the coast of Western Australia, deep beneath the ocean, lies a remote reserve of natural gas. But reaching it has been considered too challenging. Until now. So Shell has embarked on what it calls the Prelude project. Instead of piping gas to land, Shell will liquefy natural gas at sea. And here at the Samsung shipyard in South Korea, the vision is becoming a reality. As the idea turned to steel. And the blocks turned into the hull.. The success of this project is in our hands at the end of the day. Now the team is preparing for its greatest test yet. It's time to launch the biggest hull ever sent to sea. Willie Gray is getting ready to make history. In less than 24 hours his team will float a hull measuring, nearly half a kilometer long and weighing more than 200,000 tonnes. It's a moment that's been years in the planning. But they will have just two hours to make it happen. So we have from about 7 am to 8:45, is the tidal window. So it's quite short actually. And if we don't achieve it then the next one is in the evening and that's in total darkness and we have to wait until the following morning again. So everything is geared up to meet that key timing on Saturday morning. During that time, the hull will be navigated across the harbour, where the next stage of construction awaits. So it's a great day and of course for any Scotsman, it's St Andrews day, so we absolutely have to meet that target. And getting to this target has been a remarkable achievement. In May this dry dock was nearly empty. Less than 8 months later sits the largest hull ever built. It's a fantastic sight, it really is. For Huw Jones it means the task of fitting the liquefaction modules can now begin. Each year these modules will produce enough natural gas to meet the needs of a city larger than Hong Kong. There are 14 different modules all doing different things. Each module weighs on average about 5, 5 and a half thousand tones. So right here in front of you today, there's about a quarter of it sitting on this quayside. Inside the dry dock, the engineers are making one last inspection. Because once launched it will be 25 years before Prelude will return. Here we are standing in the moonpool area. This is where we introduce the gas and liquids so they can be processed on the topsides. Tomorrow morning the structure must be floated off these support blocks, then navigated safely out of the dry dock. There is no margin for error. This draft, 80 centimetres. It’s not very much, its tight, but we're in good hands. No one's nervous, we're in good hands. SHI are experts at this. This is what they do. As temperatures dip to zero, the launch team gets ready to start. At 9:15 right on schedule the vast valves to the dry dock open. And Willie Gray is watching closely. Well it's now 20 to 11 at night and we commenced filling the dock actually at 915. There are 60 persons on board who have been positioned in strategic locations. It's a precautionary measure. We're expecting to commence floating sometime around 1 to 1:30 tomorrow morning. And at 7 o'clock, when it becomes first light, we should commence to tow out from the dock. In the early hours of the morning Prelude starts to float. By day break, the hull is standing tall. Morning Mr An, how are you? No wind? Conditions for launch are near perfect. The weather's just above freezing. It's just getting to first light. It's going to be a brilliant day and everybody is looking forward to the big event. The tug boats jostle into position, 9 are needed for the short journey across the harbour..
And with that sound Prelude, slips out of the dry dock. It's really fantastic, amazing, unbelievable. We made it. Yeah, we are very proud of it. And we can say it in French.... Fantastique. It's a special moment for the Prelude team and there to witness is a crowd of nearly 500 people. We've got all the families of Shell and of Technip here as well. They've all come to Korea, you know it's a big step for them to be working here too. And for them to be part of this great event is absolutely fantastic, it's great to have them. Can you forget this? Will you forget this? It's absolutely fantastic, unbelievable. By the time we put our modules on, it's going to be higher than that accommodation block the whole length. After 18 million hours of design and development. Including 14 months in construction. Prelude slides gracefully across the water. For Willie Gray there's time for a snap shot for the family album. And a pat on the back from the boss. Well done mate I'm really proud of you. Today they can celebrate. But tomorrow it's back to work. Because once moored a whole new phase of the project is about to begin. 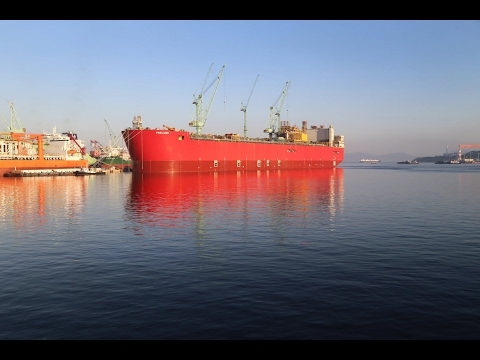 Shell’s Prelude project at Samsung Shipyard in South Korea. A giant step forward is about to be takne. Worker grinding metal with power tool causing many sparks to fly. Workers on bikes going past. Aerial view of shipyard. 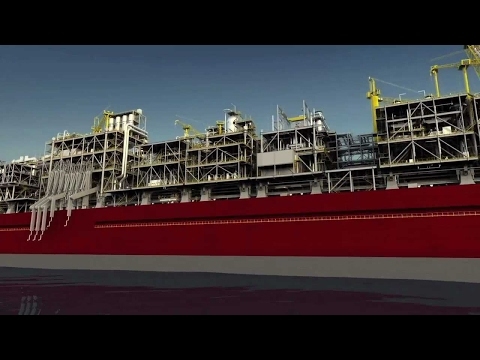 Time lapse video of floating liquid natural gas (FLNG) facility being build. Worker welding metal above him. Willie Gray walking along construction site. Willie Gray looking under hull with flashlight. 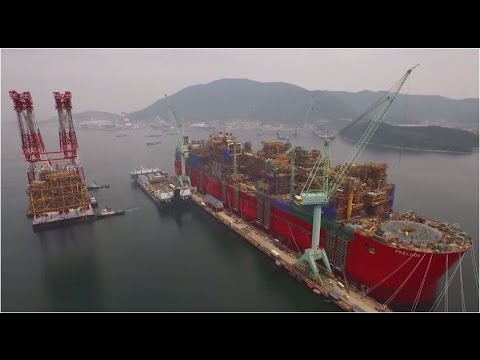 It’s a Friday afternoon at the Samsung Shipyard in South Korea, and a giant step forward in the creation of Shell’s Prelude project is about to be taken. Just three months ago, the keel was laid for the world’s first floating liquid natural gas facility, and one of the most ambitious engineering projects in the world of energy began to emerge. Today, Willie Gray is preparing for the next big milestone. His team is responsible for what the engineers like to call the substructure. Put simply, it’s the biggest hull ever built. This is part of the half-section. It’s 60,000 tons. Willie Gray looking around with flashlight. Willing walking around under hull. For over a year now, Willie has been hard at it, working long hours to make sure it all takes shape. My wife always complains that I’m married to Samsung and not to her. She’s actually just left today to go back to the UK. I’m not sure if tomorrow’s event’s got something to do with that. Shipyard with signs in Korean lettering. Tomorrow, Willie’s team faces their biggest test yet in this daunting challenge. Energetic guitar and drums rock music plays. Crew welding and walking around the yard. Bulldozer moving crate. Forklift moving gas tanks. Worker wearing Shell logo hard hat. Half-section with two big pink spherical tanks. Second half-section with big U-shaped gaps. Willie walking around inspecting pillars. After months of sweat and toil and precision engineering, two sections of the enormous hull are set to be joined together. To do that, the 60,000 ton half-section must be transported across Geoje Harbour to join its twin. It’s an operation that will require all the skill of a surgeon, so Willie and the team are making doubly sure everything is in place. Arto Hopeakoski. Construction Quality Lead. There’s a few thousand blocks underneath keel blocks. If they are off the tolerance, then you may have a punctured bottom plate or some indents. Panning shot of keel blocks in harbor. Shot of half-section with two pink spherical tanks. Willie Gray in front of half section speaking to camera. If all goes to plan, by Monday nearly half a kilometer of hull will be perched neatly on top of those blocks in the dry-dock. If it doesn’t, it could seriously jeopardize this world-first project. We’re not expecting that to happen, but we actually won’t find out until Monday morning, so I suppose there’ll be a few people that are maybe thinking about that a bit over the weekend. Upbeat drum and bass music. People walking along a beach. Someone driving a personal water craft towing a canoe full of people. People in the water with inflatable rings. It’s summer vacation in South Korea. The shipyard is almost entirely on holiday, except for the team working on Prelude. Workers in shipyard turning valves and walking around. Aerial time lapse shot of shipyard at night, lit up with bright lights. Area near half-section with big tanks filling up with water. Willie Gray looking intently off at something. Shot of half-section floating on water in shipyard. At midnight, the valves are opened, and the delicate process of sinking the floating dock begins. Millions of liters of water enter the ballast tanks beneath the surface. As the dock slowly submerges, for the first time the 60,000 ton structure begins to float. By daybreak, when Willie arrives, he’s greeted with this. Willie speaking to camera. Water pouring out of ship at bottom. Well, everything’s going quite well, actually. It has a little bit of a heel towards port side at the moment. That will be adjusted using the ballast pumps on board. We will see how that progresses and how long that’s going to take. 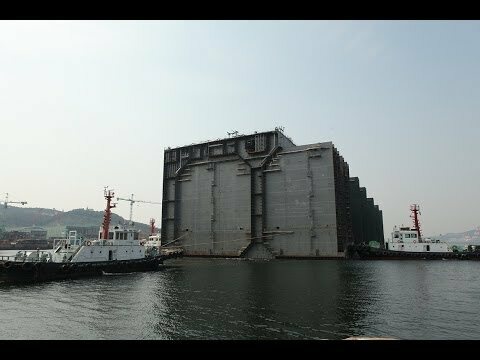 Time lapse of water flowing into dry-dock covering keel blocks. Dry-dock filling with water again in time lapse. Time lapse of floating gate being pulled away by boats. People biking, heat rising from the asphalt. Workers walking along a railing. D. U. Lee speaking with another engineer. Over at the dry-dock, it’s a slightly different procedure. Water flows in, gradually easing the aft section off the keel blocks below, but things don’t go completely to plan. In the early hours, a small leak in the ballast tank force the operation to grind to a halt. Fortunately, the problem was quickly solved. At daybreak, everything is in place and the gates to the dry-dock now can be removed. By mid-day, conditions are heating up. Temperatures have soared into the high 30s. The Samsung project manager D. U. Lee is getting an update. He’s been working here for years, but has never built anything like this before. D. U. Lee. Samsung Heavy Industries. D. U. Lee speaking to camera. The conditions are so calm. It is very, very useful to float for this project. So, I think God is helping us now. Workers chanting in Korean and doing a group huddle. Workers boarding a small boat. Boat with workers moving towards hull. Willie’s team of engineers looks on at the hull. Aerial shot of shipyard. Willie Gray speaking to camera with engineers in background. At 1:00, the marine crew takes control, boarding the hull to prepare for the tugboats. No less than six will be needed for the job. This is the culmination of a lot of work for the shipyard, a lot of pre-planning. I think probably in about 30 or 40 minutes from now it should be entering into dry-dock number three. Time lapse of tugboats pulling half-section across to other dry-dock. Cables connected across hull to secure it to the dock. Workers look on. And right on schedule, the launch begins. The tugs navigate a 1.5 kilometer stretch of the harbor, then wrestle the hull through the gates of the dry-dock. Engineers looking at the hull across the water. Panning shot of tugboat pulling half-section. Frank Groen speaking to camera. Panning shot showing height of hull. Inside, the full scale of the project is beginning to emerge. I think it really comes to light now, the size of the facility. You look at the top section on the top deck, you’ve got 40 meters above that yet, so, yes, it’s massive. So, you’ve got so many facets. You’ve got the marine piece with the hull structure, you’ve got the process piece which sits on top, as well as the communications piece. I’ve been around Shell for 32 years. This thing has got to be one of the biggest things I’ve ever seen in my life. Half-section in water pulled by tugboats. Sunset through evergreen trees. Half-section with big pink tanks floating on water. It’s been 17 hours, and so far so good, but as the day draws to a close, one of the most critical parts of the whole operation is about to begin. Red and white cables attaching hull to side of dock. Panning shot of cables attached to hull. Worker walking and speaking into radio, then signaling with hands. Time lapse of cables being attached and pulled to move hull into position at nighttime. Hundreds of tension lines are hooked up. As water leaves the dry-dock, these ropes will be twisted and turned, gradually pulling the hull onto the heel blocks below. It’s a dangerous operation that needs to be carefully managed, and if one of the ropes were to snap, the consequences could be fatal. The procedure continues through the night. It will be morning before the Prelude team can truly gauge its success. Sun rising over shipyard. Shipyard sign reading Samsung. Engineers on bikes and scooters. Willie on a bicycle. Engineers welding bottom of hull, which has big round holes in it. Willie and Arto inspecting keel blocks. At sunrise on Monday, the Samsung shipyard springs back to life. Thousands return to work where the two sections are now standing tall. Months of planning has come down to this. It’s time to inspect the hull. The dry-dock is already buzzing with activity. Willie and Arto get straight to it checking for any signs of damage. We’re just making sure that there wasn’t any heavy touch points during launching or keel touchdown. It all looks perfectly okay. Willie inspecting welded areas on hull with flashlight. Willie using measuring tape to measure the gap. Willie speaking to camera. Now to the critical point where the hull comes together. If you look through the gap here, you can see all the way up to the upper deck. Despite all the challenges, it’s come down to just millimeters. The gap is fairly uniform, about 10 millimeters, and the offset between the two section is varying between 10 and 20. The two blocks match perfectly. Panning shots of hull. Worker welding bottom of hull. Willie and Arto gazing up. Willie and Arto looking at camera with hull in background. The sections are a world away from becoming the hull of the largest offshore floating facility ever built. It’s a huge achievement for the Prelude team, but Willie knows there’s little time for celebration. We’ve done well so far, but the challenges ahead are great, but not insurmountable. Worker welding hull. Worker using wrench. Hull in shipyard. There’s much to be done, but the creation of the world’s first FLNG facility has just moved closer to becoming a reality. At sites in South Korea, France and Australia, preparations are made for a major technological advance in LNG production. As the sun rises, nearly 30,000 workers prepare to start their day at one of the biggest shipyards in the world. For many of them, this is special. They’re creating history, in a world first project that will change the energy industry. Various scenes of shipyard workers at work with large machinery. Worker in protective clothing working with welding equipment. Large machine moves across factory. It’s pretty courageous what we do here, but that’s how you push the boundary. Welder at work. Robe talking with large machinery in background. If we fail, which we will not, yes, then, you know, your reputation is at stake. Shell calls this the Prelude Project, a complicated blend of technology and engineering. It’s being built and designed in no fewer than ten countries. Large crane at work in fast motion. Steam being emitted from machinery. Large machinery being lifted by crane. Before a single piece of steel was cut here in Geoje, there was already over four and a half million hours spend in development. Design software being used on a computer screen. 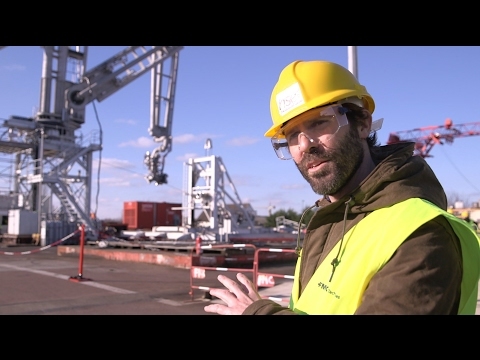 In Paris, engineer James Nafraicheur is just one of hundreds working to make the plans a reality. Long shots of cityscape, Paris, France. James Nafraicheur at work at his desk with design software. The really cool thing about what we’re doing is designing something that we’ve never, never built before, and putting a cryogenic liquefaction plant in the middle of the ocean. Workers wearing protective clothing hooking up pipes. It’s an immense challenge, but Prelude is set to be a game changer. Put simply, it will be the largest structure ever sent to sea. Korean shipyard workers at work. Worker pointing to something. Exterior shot of scaffolding around Prelude. So big it will contain enough steel to build the equivalent of 35 Eiffel towers. Component parts of the Prelude project being assembled. All these blocks will become gigablocks. Think of it as Lego. Lots of these blocks being put together, it’s absolutely huge. Every day there are so many more whole blocks everywhere, it’s magnificent. The sheer scale and ingenuity of this structure is dwarfed only by its uniqueness. In a revolutionary approach, instead of piping natural gas to land, Shell will be taking an entire gas plant to sea. Animated sequence of the Prelude project, showing the floating gas plant on the surface of the ocean with operations on the sea floor. Frank Groen and Chris McDermott are just two of the 150 staff that will live and work on board the facility during normal operations. They’re telling us that it’s going to be like a motel, but, you know, it’s yet to see. But this will be no holiday. Prelude’s destination, 200 kilometers off the North West coast of Australia, is right in the middle of cyclone alley. Stormy seas with pounding waves. This thing is built for cyclonic conditions, so it’ll be fine, but it’s a big facility, you know, it’s going to be quite interesting to be out there with a cat five cyclone going over the top. So engineers have designed an anchoring system on a scale that has never been attempted before. Animated sequence showing how the sea floor operations connect to the carrier. Gas from the field enters the vessel through the turret, which is held in place by four groups of mooring lines. The facility can then rotate around the turret, responding to the ocean’s movements, no matter what the conditions. During a cyclone, with a more than 20 meter sea height, the vessel remains on station, and will remain with the main complement of personnel on board. So there’s a lot riding on us to get it right. We just cannot afford any incident when we are offshore. It’s too far away, it has too big consequences. So what leaves here needs to be of top quality, and otherwise it will not leave here. The obstacles are substantial, but so are the rewards. Each year, Prelude will produce enough liquid natural gas to meet the needs of a city the size of Hong Kong. Korean shipyard workers at work. And the prize of doing this from places never before thought viable is seen as crucial to the world’s energy future. I'm really excited, it is a huge responsibility I must say, but it’s a great feeling to be part of this. 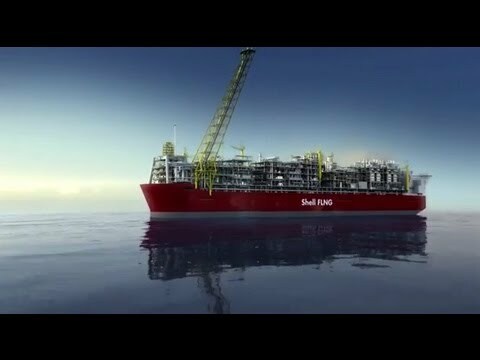 Made to meet the world’s growing energy demand for the cleanest burning fossil fuel, the Shell FLNG floating facility will open new natural gas fields at sea, and this video uses simulated images and models to illustrate the dimensions, weight, capacity, durability and location of the facility. Zoom in on simulated wide angle side-view animation of Shell FLNG facility, hull coloured in red and bearing the words “Shell FLNG” and parts of the superstructure coloured in yellow. The facility casts its shadows on the water as it moves. Blue skies and gentle blue seas form the background, with skies lit to white at the horizon. Shell has announced that it’s to build the world’s largest offshore floating facility, which will be a game changer for the energy industry. Zoom in and pan to reverse angle view of the simulated animation. Again, blue skies and seas form the background, together with the white glare of sunlight and faintly pinkish hues towards the horizon. Pull back to wide angle bird’s eye view, revealing more detail of the superstructure. Reverse low angle zoom in at hull level, panning the length of the ship and pulling back to reveal the receding stern. From bow to stern, Shell’s FLNG facility will be 488 metres, longer than four football fields, and will weigh around 600,000 tonnes – roughly six times as much as the largest aircraft carrier. Dissolve to close-up of the grey and yellow superstructure at the stern, panning and pulling back to reverse angle of the same. Dissolve to low angle view of the hull, zooming sternwards, as the facility moves to dock at another facility lying parallel to it, frame-right. White-domed reservoirs line the dock. The water between bears the reflection of both of these facilities. Blue skies and white sunlight can be seen in the background. Shell’s FLNG facility will produce gas from offshore fields, liquefying it on-board by chilling it to -162˚ Celsius. This shrinks the gas by 600 times, allowing it to be shipped globally. White flash dissolve to zoom in on animation of the globe of the world, Australia in clear view in hues of pink and brown, and white clouds visible over both the continent and the blue seas. Zoom to the North-western coastline of Western Australia, focusing on the town of Broome. Blue oceans stretch to the north of the coastline and continent seen in hues of brown and green in the lower portion of the frame. Shell will be deploying this revolutionary technology first 200 kilometres offshore in Australian waters. White flash dissolve to front view of the FLNG facility, pulling back to an extreme wide angle shot of the facility atop blue waters with blue skies above. Pan to underwater shot, still showing the facility above the waters, but revealing a simulated animation of the gas fields on the sea bed, with a network of pipelines stretching along the sea bed and facilities, coloured in yellow, spread across the sea bed. One small part of the facility on the seabed is coloured in blue. The facility will be built at a shipyard in Korea and will be used to help open up new natural gas fields at sea that are currently considered too costly or difficult to develop. White flash dissolve to wide, oblique angle view of a model of the FLNG facility, a second smaller floating facility alongside of it, frame-left. The two are attached with cables from above, and are resting in rippling, turquoise waters, with sparsely-lit buildings/structures forming the background beyond. White flash dissolve to close-up of the length of the ship model, stern foremost, lifting and dipping in rough waters. Its sheer size will help it withstand very high winds and giant waves. It’s been designed to withstand the severest cyclones – those of category five. White flash dissolve to aerial zoom in on the stern superstructure, panning around and down to a front-view shot of the stern, including hull and superstructure. The background of blue seas pans to a background of blue skies, fading to pinks as they meet the water at the horizon. As a ground-breaking innovation, this will help meet the world’s growing energy demand for the cleanest burning fossil fuel. White flash dissolve to wide, oblique-angle shot of the superstructure at the bow, including a helipad with helicopter in the foreground. Behind the helipad, a huge Shell logo adorns the superstructure. Blue skies and a setting sun form the background. Zoom to animated simulation of the helicopter as it rises upwards and out of the frame. Dissolve to wide panning view of the FLNG facility, the background of skies and seas depicted in matching hues of blues and pinks as the sun sets behind the floating facility. Zoom to oblique angle view of the facility from stern to bow, the Shell logo on the stern superstructure clear in the foreground and to right of frame. Shell’s decision to make FLNG a reality culminates more than a decade of research and development and 1.6 million man-hours. It builds on the company’s extensive knowledge of offshore production, gas liquefaction, LNG shipping and the delivery of major projects. Meet the captain in charge of towing Shell’s liquified natural gas facility from South Korea to Australia. The Prelude FLNG facility will produce natural gas off the coast of Australia. The world’s first gas-fuelled cruise ships will set sail in Europe over the next few years.